The end of the SK Telecom TI dominance? It is no longer a "slow start" for SK Telecom T1 with three games remaining in the regular schedule of the spring split. At a record of 6-9 and needing to win out to get to .500, SKT has already guaranteed itself the worst season in team history, spanning all the way back to the organization's entrance into League of Legends in late 2012. This is not the first time SKT's dominance has been questioned. Back in 2014, the defending world championship roster failed to even make it back to worlds, which were being held in the team's home country of South Korea, with SKT falling in the regionals and blowing up the roster not too long after. Last year, the team went on an eight-game losing skid before turning it around at the climax of the summer domestic season to make a heroic run to the final, before falling to the now-Kingzone DragonX. It's just what SKT does. It's what Lee "Faker" Sang-hyeok and Kim "Kkoma" Jung-Gyun have done since the two connected in the spring of 2013. Anytime SKT has stumbled, it's recovered; even though SKT fell to Samsung Galaxy in straight sets at the 2017 worlds final in Beijing, the feeling of a rebirth right around the corner was there. When it was announced Faker was returning for another season in his signature red SKT jacket, there was optimism. Although the team didn't sign any big free agents or make moves to strengthen the roster -- actually doing the opposite by losing two of its starters -- history foretold another season where SKT would start slow before picking up steam to make another run toward another final. This is not the SKT of old. For the first time in SKT's history, it is in danger of missing the knockout round of a domestic season. And to be honest, it doesn't deserve to be in the playoffs this split. When compared to the likes of this season's top teams in Kingzone, Afreeca Freecs, and even SKT's archrival KT Rolster, SKT shouldn't even be in the discussion with those teams. Right now at the current level SKT is playing, it is closer to the worst team in the league, Kongdoo Monster, than than the top. On the surface, the team looks better than it actually is. If you look at stats alone, you would think SKT was going about business as usual. Bae "Bang" Jun-sik is having a career year when it comes to putting up numbers, with the No. 1 KDA of all starters in the league (8.8) and having the fourth most kills. Outdoing him in third place on the kills ranking is his teammate Faker, who statistically is also having one of his better seasons, carrying the load for his team when it comes to kill participation and putting up the one-v-everyone highlight plays that he's become renowned for since his rookie days. The individual level is not where this team fails, though. When you peel back the stats of the team's two star players, you see the countless holes on this roster. Not once this season has this team been comfortable. Even when SKT went on a mini-resurgence in the middle of the season to get back in the playoff race, it was more fool's gold than anything else. When rookie Park "Blossom" Beom-chan was inserted into the roster, the team became sloppier but at least had an identity behind it, and yet it didn't last. Over the past two weeks, SKT has returned to former starting jungler Kang "Blank" Sun-gu in favor of the rookie, hoping that the team's experience could save it in the face of Kingzone and KT Rolster. It didn't work, and for the first time in the team's history, Kkoma and the team's staff is scrambling, left with no answer on a roster that simply doesn't know how to play together. While Faker statistically is fine, this will go down as the season he'll want to forget when he finally decides to hang up his keyboard. Throughout the campaign, the best player in the world has made mistakes that could only be expected from amateur players. In the team's most recent series with relegation-bound BBQ Olivers, Faker on Kassadin chased under a turret inside the Olivers' base, dying to AD carry Jang "Ghost" Yong-jun in a scene that would be considered intentional feeding in a solo queue game. There is no synergy on the current SKT roster. 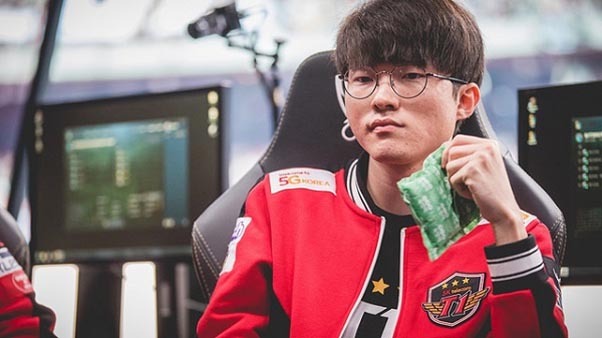 In the past, Faker's brilliance shone the brightest when he could play support champions like Lulu and facilitate his teammates while falling back on high-damage carry champions when necessary. Now, it's the complete opposite, as Faker routinely flings himself into battle with no one around him, needing to make a desperate play to keep his team in the game. 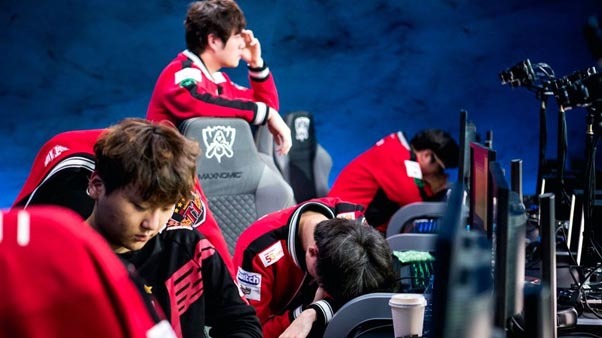 The macro game for SKT, which is the team's hallmark, is now woeful. SKT ranks eighth when it comes to grabbing first blood, second-to-last in terms of overall gold differential at 15, and inexplicably is the worst team in the entire league when it comes to knocking down the first turret at 26 percent. Kongdoo Monster, far and away the worst team, gets the bonus first turret gold in 38 percent of its games, which isn't good but not nearly as bad as SKT. SKT's early game isn't good, its mid-game ranges from average to laughable, and too many times this season the team has made those amateurish errors not expected from an SKT-coached squad when the game is on the line in the late game. When SKT flexed its longtime support Lee "Wolf" Jae-wan to the jungle role, it was the first time in SKT's existence that it showed desperation. It was a clear signal that the team didn't think it had the personnel necessary to compete. After a few games, Wolf's poor stint in the jungle was over, and the team moved on to Blossom before switching back to Blank. Blank, who had to watch as the team favored a support main and a rookie with zero pro experience over him for a majority of the season, hasn't been the same ever since, playing like all the confidence he once possessed has been drained from him. Blank this season is a good microcosm of the team at large. There is no confidence in any of the team's moves, and when big plays happen, there is a sense of distress behind them, no rhyme or reason to the team's play. For the first time in SKT's legendary history, the odds are not in its favor to make the playoffs. When it plays KSV Esports in its upcoming match, it will be do-or-die for SKT. A loss almost certainly will knock the team out of playoff contention. And maybe, as illogical as it sounds, that would be a good thing for SKT. Maybe the team needs to be fully broken into nothing before it can hope to be rebuilt once again like it did at the start of the 2015 season. Because right now as it stands, SKT is not whole -- its a collection of pieces that might look good by themselves, but when examined together, make for a misaligned puzzle. It's time for SKT to realize that regardless how much it wants to force in some of the pieces it has on the roster and make them work, sometimes those pieces just aren't made to fit.